Surfactants (surface-active agent) are defined as substances capable of changing the surface or interfacial properties significantly. Addition of small amounts of surfactants into water decreases surface tension significantly. Namely, it is not called a surfactant if it does not decrease the surface tension of aqueous solutions. 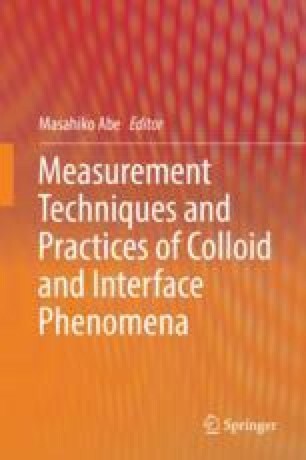 This chapter introduces the physical definition of surface tension and methods to measure it, such as Wilhelmy plate method and Du Nöuy method. The most popular methods and essential points for the measurement are explained. Surface tension measurements enable to determine the critical micelle concentration (cmc) of the surfactant, calculate the amount of surfactant adsorbed on the surface, and to determine the miscibility of two surfactants in mixed micellar solutions.